Felicia Williams, Community Liaison for Buffalo City Council member Darius Pridgen, holds a package of 'Ring Pots' sweets. ANTI-DRUG ACTIVISTS are campaigning to have sweets shaped like marijuana leaves removed from shelves in Buffalo, New York. The sweets won’t get kids high, but aghast city leaders say the product and grocers carrying it represent a new low. 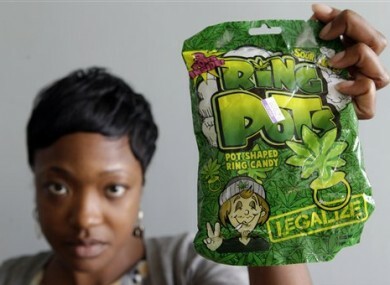 The “Pothead Ring Pots,” ”Pothead Lollipops” and bagged candy are distributed to retail stores by the novelty supply company Kalan LP of the Philadelphia suburb of Lansdowne. It also wholesales online for $1 for a lollipop and $1.50 for a package of three rings. Company president Andrew Kalan said the candy, on the market six to nine months and in 1,000 stores around the country, promotes the legalisation of marijuana. This is the first complaint I’ve heard, and people are usually not shy. I’m actually surprised this is the first. An irate parent brought the candy to Pridgen’s attention, hoping the city could apply pressure and get it out of stores. Pridgen and Council member Demone Smith displayed the candy, along with fake marijuana known as “K2″ that’s also sold in some stores at the most recent Common Council meeting, where Pridgen said he’d refuse to grant licenses to stores in his district that planned to sell the merchandise and would seek to embarrass stores that carry it. The synthetic marijuana is sold as incense but is smoked. Synthetic marijuana typically involves dried plant material sprayed with one of several chemical compounds. The products contain organic leaves coated with chemicals that provide a marijuana-like high when smoked. The Drug Enforcement Administration recently used its emergency powers to outlaw five chemicals found in synthetic marijuana. It appeared Pridgen’s message had gotten out by the end of last week. A check of about a half-dozen stores in Buffalo, often in impoverished neighborhoods where real drugs are a festering problem, turned up none of the controversial candy. The bags of “Pothead Sour Gummy Candy,” and lollipops shaped like marijuana leaves appear to be a recent addition to the inventory of some corner stores. The sour apple-flavored candy contains nothing illegal, but with its marijuana leaf, the word “Legalise” and a joint-smoking, peace sign-waving user on the packaging, critics say it’s not only in poor taste but an invitation to try the real thing. “It’s the whole idea that it promotes drugs and the idea that, here, you’ll look cool if you use this — which is what gets these kids in trouble in the very first place,” said Jodie Altman, program supervisor at Renaissance House, a treatment centre for drug- and alcohol-addicted youth. Charmaine Rosendary, 36, of Buffalo shook her head when she saw a picture of the package. “That’s not right. It’s just promoting marijuana,” she said while buying produce Friday at a Buffalo market. She said she wouldn’t allow her five teenagers, ages 15-19, to have it. In 2008, the Hershey Co. stopped making Ice Breakers Pacs in response to criticism that the mints looked too much like illegal street drugs. Police in Philadelphia complained that the packets, nickel-sized dissolvable pouches with a powdered sweetener inside, closely resembled tiny heat-sealed bags used to sell powdered street drugs. Candy cigarettes and fruity or energy drink-infused alcoholic beverages have been criticized for targeting young people. And in 1997, the Federal Trade Commission said the iconic Joe Camel cigarette ads and packaging violated federal law because they appealed to kids under 18. The tobacco company, R.J. Reynolds, eventually shelved the caricature. A spokesman for the Office of National Drug Control Policy said advocates for legalisation who claim marijuana is benign are not supported by science. “Trivialising drug use is a threat to public health because it erodes perceptions of harm among young people,” said Rafael Lemaitre. Kalan said his company carries several products with the marijuana leaf and “legalise” message to accommodate growing demand in the movement to legalise marijuana. Email “Marijuana-shaped sweets spark outrage”. Feedback on “Marijuana-shaped sweets spark outrage”.